Im really pumped to share Project 100 to the world of entrepreneurship. 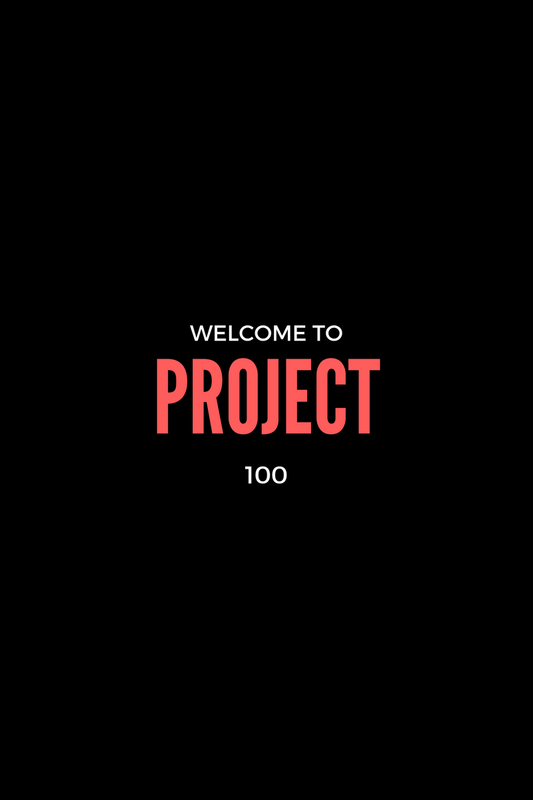 Im really pumped to share Project 100 to the world of entrepreneurship. Over the past 4 years I’ve learned a wide range of skills and worked with high class indinvduals across multiple channels and disciplines. It has been a goal of mine to be able to share the expertise Ive collected over the years, the expertise of others with as many small businesses and startups as possible; in a form where If Project 100 doesn't deliver then the startup/brand doesn't pay and is not responsible for the wasted time, money and in same cases equity. From teams as small as 2 first time entrepreneurs starting in their moms basement to startups who recently completed there “series A round of funding” we want to help drive results FIRST and collect what we believe we are worth financially SECOND; and do so in a very deep/organic fashion. Project 100 is a way for small businesses and brands with little to no expendable marketing & staff budget to receive top knowledge, expertise and experience around all things (marketing, growth, business development , culture & leadership etc.). We’ve built a knockout curriculum that will provide you with unparalleled IP on the world of modern day marketing. You’ll leave with all the practical marketing advice and tools, to grow and scale your business. Now you may be thinking, whats the difference between Project 100 and any other marketing agency/consultancy? The difference is simple; we are determined to jump DEEP into the depths of your brand and find organic and authentic ways to grow the brand as well as grow with the brand. Problem: You need support on all social media channels, you have a desire to drive further results through partnership and business development, and your struggling to hon in on your brand message and strategy. You currently have 2 part time team members with very little startup experience, and your finding yourself carrying the load; and if you were to be honest your experience and expertise aren't up to par! Solution/Process: Project 100 will provide you the following. We will provide you social media strategy, support on content strategy & development, help you understand and implement best practices for hiring/culture, implement cold email, cold calls and biz dev strategy on your behalf. We will collectively agree on either a (back pay modal, future revenue sharing modal, equity modal or a combination of the 3) in exchange for our services “only if we complete each task on time and at the agreed upon level & quality. So is the difference clear enough? Most consultancy expect upfront salary and in some cases compensation on the backend. They expect a structured and limited amount of face to face time, and at times the quality of work doesn't live up to what you expected. Leaving you in a situation where you have now not only spent time but the last bit of your finances on serves that didn't deliver the results needed. To be completely transparent our goal is split in two directions. Adding 100% measurable value to brands on a consistent basis is the main goal and focus. We want all startups and small businesses with limited funding & budget to have access to valuable strategy/implementation thus have access to value driven results! Our secondary focus is to not only add value to 100 brands, but to build substantial partnerships, relationships and to gain equity with the 100 brands. We are not afraid to admit that our business modal is contingent on the value we generate, but we do believe if and when the value is generated we should be compensated well for it; from brands we believe in of course. Please reach out to Anthony D. Vaughan @ project100llc@gmail.com if you want to learn more!